This one isn’t a recipe, but rather is a shopping list. Yes, it was written on the back of a recipe, but we will get to that later. What I like is that this lists out a variety of items and their costs. 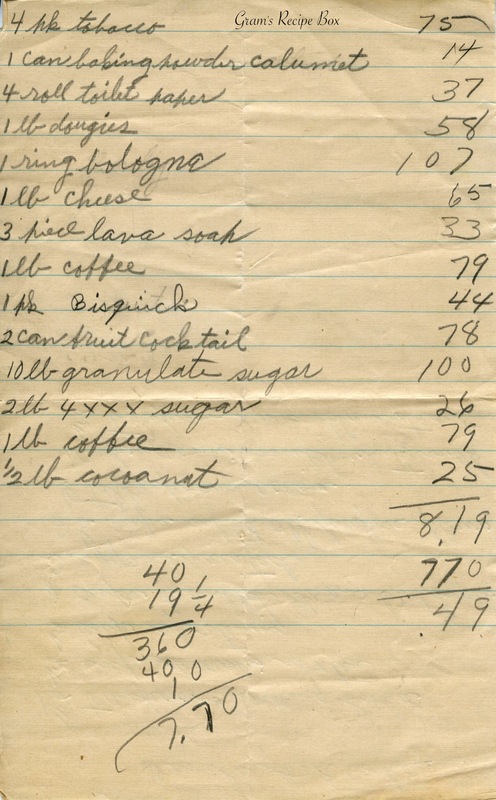 The list is from a time when 10 pounds of sugar cost $1.00, a pound of coffee was 79 cents and a pound of cheese 65 cents (probably the 1950s). The total shopping trip cost $8.19 and there’s some high finance off to the left (multiplication if you can recognize it after all the exposure to calculators and automation these days) with the total from that being subtracted from the shopping total. Was this the reimbursement for bottle returns? Selling eggs to the grocer? We shall never know, but it appears our housewife wound up paying just 49 cents for everything. Talk about extreme couponing! I remember those days, my childhood friends and I would walk along the roads and picked up pop bottles so we could go down to the candy shop which was right in front of Col. Parker’s house (Elvis Presley’s promoter and manager). It was a time were plastic bottles and container were only a dream. You could walk into the grocery store and see people bringing whole shopping carts full of coke bottles for redemption. Wish they were back, I’d love to see kids today bringing their bottles to the store instead of sitting in front of a screen playing video games.